#CodetrainQueens Priscilla Amponsah-Yeboah is a Front-end Developer with a finance background. 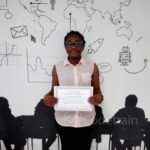 Priscilla joined the first batch of the Codetrain cohort. She completed web development training and is currently working on various web-based projects for clients. She works with Databank as a sales and customer service representative. Keep being awesome, Priscilla!